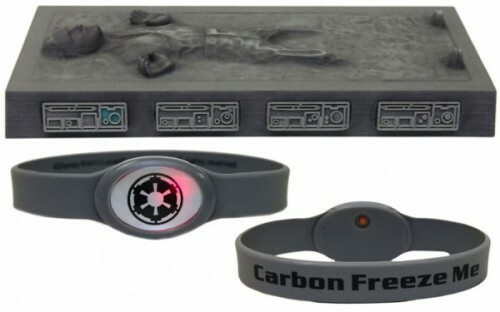 Get Your Own Face Frozen In Carbonite | OhGizmo! By David Ponce on 05/10/12 • Leave a comment! Han Solo frozen in Carbonite is one of those movie icons that never ceases to be popular. Call it a classic. But now you can get your own such figurine, except instead of Han Solo’s face you can have your very own likeness. First you have to go to Disney World in Orlando during a Star Wars Weekend, which is a special event celebrating the movies and such. Then you go to the Carbon-Freeze Me area where you’ll sit for about 30 minutes while expensive cameras take your pictures from several different angles. Once you’ve found that perfect shot, you pay a cool $99 plus shipping and go on your day. 4 weeks later your 8 inch figurine will arrive in the mail. You also get a commemorative bracelet for your troubles. Know that this starts on May 18th, but that you’ll have to reserve your spot in advance and you must have purchased tickets for the theme park as well. You can reserve now by calling 407-WDW-TECH (407-939-8324).